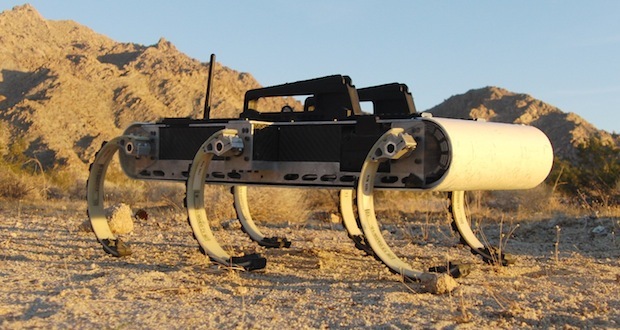 Military robots are almost two a-penny, but few of them will incite fear and loathing at the tingling nerves at the top of your spine like this one–a six legged, half-wheel bot that can happily jump curbs and pad across deserts to spy on you. RHex is a crawling robot we’ve seen before, coming from research at MIT and with a pedigree that includes Boston Dynamics (the makers of the larger, wickedly scary BigDog), but the diminutive beast has just had a big upgrade and is now stronger and more reliable than his predecessor. Developed in part with DARPA funding, the new X-RHex is undeniably a military beasty–he’s even fitted with military-grade equipment mounting rails on the top. The basic principle is that the robot’s weird half-wheel, half-leg traction system means it can tackle steps, flat concrete or desert sand just as easily. In fact X-RHex can tromp along under its own electrical power for up to two hours–making it an ideal short range spybot for the kind of environment that the U.S. forces find themselves deployed to at the moment. Check it out–and then add it to the list of military ‘bots that give you the chills.